It is stated in the newspapers that the United States has entertained with favor the application made by the Commission of Exchanges for leave to provide with blankets the prisoners of war confined to Elmira and elsewhere. It is further stated that in order to accelerate action so as to give this relief to perishing thousands before the severity of our climate shall have destroyed them, permission was solicited for the transportation of a cargo of cotton to this city, here to be converted to the purpose by late. A number of citizens, impelled by motives of humanity, have observed with pain and anxiety that at this point the negotiation pauses. Each chilly night increases the anxiety; the thought that poor men are perishing from the cold cannot be thrust away; it will intrude. These citizens have pressed me to head an appeal to your Excellency to act, and to act favorably to this measure. It has appeared to me that if this act of charity and humanity is to be performed, it had best be the spontaneous act of the Executive on his own motion and from the promptings of his own benevolence. In this view of the matter, I have declined to concur in any public application to you, whilst I can suppose it to be unnecessary. Merely for my personal direction I solicit the favor of information of whether your Excellency intends to comply with the request in question. I beg an early reply. Among the minor mysteries in Lincoln's presidential papers is a handwritten letter from C. Godfrey Gunther on mayoral stationery but labeled "Unofficial and private." Undated by Gunther, the letter carries a notation apparently added by some archivist along the way: "1864?" The communication concerned getting blankets to prisoners of war in the Finger Lakes city of Elmira before the harsh upstate winter gripped the camp that had received its first Confederate POWs in the summer of 1864. "if this act of charity and humanity is to be performed, it had best be the spontaneous act of the Executive on his own motion and from the promptings of his own benevolence." 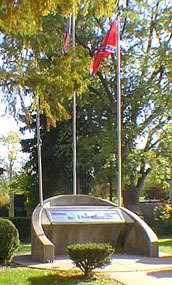 An historical memorial marking the Elmira POW camp site in upstate NY includes United States and Confederate States flags as well as photo-illustrated text. The latter explains, among other things, how runaway slave John W. Jones handled the burials with great care, respect and meticulous record keeping. A plaque in his honor marks an entrance to the Confederate section of Woodlawn National Cemetery. 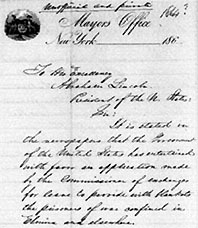 The letter concludes by asking the President to let the mayor know ("merely for my personal direction") if Lincoln intended to grant the request. An intriguing question arises relative to the timing of the letter and its seeming effort to be "unofficial and private." If written prior to Election Day, Nov. 8, 1964, was it a sincere attempt by Gunther to remove the blanket project from the realm of Presidential politics? Or was it a ploy to have Lincoln make known his intent early enough, one way or the other, so that Peace Democrats promoting the blanket project could take credit for initiating it or, alternately, attack the President for thwarting it? If written after Lincoln had won re-election, did its "unofficial and private" guise provide a mechanism for the Peace Democrat mayor to support the blanket project without appearing to beg a kindness from a President whom some of Gunther's supporters regarded as a mongrelizer and tyrant? 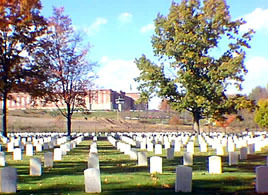 From the Confederate section of Woodlawn National Cemetery, where nearly 3,000 Elmira POWs are buried, can been seen in the distance the huge Elmira Correctional Facility, including one of its guard towers. The answers to questions raised by the existence of the undated "unofficial and private" letter from Gunther to Lincoln about the Elmira POWs blanket project may never be known. But the devastating toll exacted on the prisoners by the camp's inhumane conditions is known. Lonnie R. Speer, in his Portals to Hell: Military Prisons of the Civil War excerpted extensively elsewhere on this NYCHS web site, notes that, unlike the other POW facilities around the country up to that time, it didn't start out as a fairly acceptable place of confinement and then slowly degenerate into a concentration camp; Elmira Prison was one from the very day it began. In the 13 months that the camp operated, nearly 3,000 Confederates died there. They are buried in a special section of Elmira's Woodlawn National Cemetery where Unionist dead also are buried. So are other Americans who fought in later wars involving United States forces. The cemetery is situated next to the grounds of Elmira Correctional Facility, a New York State Department of Correctional Services prison. John W. Jones, the runaway slave whose caring burials of Elmira POWs has helped so many Southern families trace and visit a fallen Confederate relative's grave. John W. Jones, retained to handle the Elmira POW burials, had been the sexton of the Baptist Church in Elmira for decades. John, with his brothers Charles and George, escaped from Southern slavery in 1843 and came to Elmira from Leesburg, Va., after walking the hundreds of miles in 14 days, except eight miles when they got a ride from a farmer. Many a Southern family searching for the grave of a fallen Confederate relative has been grateful for the extraordinary care, respect and record-keeping diligence with which Jones went about his burial duties. Because of his faithful service, they have been able to track down and visit their kin's grave. The approximately 3,000 Confederate POW burials in Woodlawn were performed without benefit of services or ceremonies of any kind, quite unlike what was accorded one Union casualty throughout New York and other Northern states: Abraham Lincoln, whose funeral occasioned such public mourning as never seen before and rarely since. *Copyright on text. © 2001 by the New York Correction History Society and Thomas C. McCarthy. Noncommercial use of text permitted with citation of the society and/or its web site www.correctionhistory.org.